The European Research Council (ERC) will fund an ambitious solar physics project at the MPS over the next six years. The research project WHOLESUN aims to understand the formation of solar magnetic activity by studying the sun in its entirety. It is funded by a prestigious Synergy Grant from the European Research Council (ERC), which is awarded to a team of four European project leaders Researchers at the Max Planck Institute for Solar System Research (MPS) in Germany, the University of St. Andrews in the United Kingdom , the CEA Research Center in France and the University of Oslo in Norway. 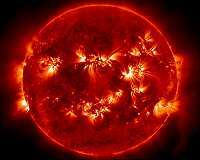 Researchers will combine their expertise in solar physics over the next six years to determine how the magnetic field is generated inside the Sun to produce sunspots on the solar surface and eruptions in the solar atmosphere. To this end, the team will try to model the Sun as a whole with supercomputers and integrate observational knowledge from space missions. The ERC has awarded 27 ERC Synergy Grants to research teams across Europe. The coveted € 250 million in grants will allow teams of two to four key researchers to bring complementary skills, knowledge and resources together to address research issues at the frontier of knowledge. Massive solar flares throw charged particles and radiation into space. "However, the source of all the eruptive phenomena we observe in the Sun's atmosphere is much deeper in our star," explains Professor Laurent Gizon, one of WHOLESUN's principal investigators and MD of MPS. Inside the sun, plasma movements create the sun's magnetic fields that drive the solar flares. Too often, solar physics is split between internal and atmospheric investigations. "The emergence and development of solar magnetic fields requires integrated consideration," says Robert Cameron of MPS. This is where the research project WHOLESUN comes in. The team will develop numerical and observational tools to track the life cycle of solar magnetic fields from their formation and reinforcement inside, their ascent to the solar surface and their eruption dynamics in the solar atmosphere. The MPS will contribute its expertise in the study of the solar interior using helioseismology and surface layer modeling with numerical simulations. The WHOLESUN project is driven by advances in supercomputing allows. "The project will develop numerical models of the entire Sun running on exascale supercomputers that perform one billion operations per second," explains study leader Allan Sacha Brun of CEA Saclay France. The numerical models are used in combination with observations to solve many unsolved mysteries in solar physics. For example, it is not known how sunspots are formed, nor what triggers the most energetic solar flares. "The science that will emerge from this ERC Synergy project help us prepare for ESA's PLATO exoplanet mission in 2026, "says Gizon. If you find our news pages informative and useful, please think about becoming a regular backer or make a one off contribution now. 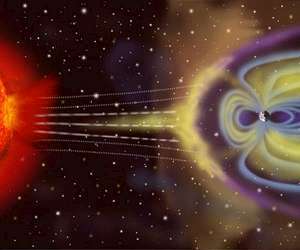 Students have successfully identified sound from a solar storm in the magnetic shield of the earth as part of a research project at the Queen Mary University of London. The findings of a group of 12 students from Eltham Hill School in southeast London have now been published in the journal Space Weather.